Book Review: "Art and Crime"
In what's billed as the first interdisciplinary essay collection of its kind, Art and Crime: Exploring the Dark Side of the Art World (Praeger, 2009) brings together contributors from many areas of the art, law, security, and library fields (plus collectors) with an interest in studying, understanding and combating art crime. Edited by Noah Charney, the director of the Association for Research into Crimes against Art (ARCA), the volume provides useful background and important case studies for anyone interested in thefts of all fine arts (not just paintings and sculpture, but also books and manuscripts). A recurring theme in these essays is the intense need for additional research into art crime, since statistical data is difficult or impossible to come by (thanks to underreporting and insufficient record-keeping by police). For the study of art crime, statistics are key - without them, as A.J.G. Tijhuis notes in his paper "Who Is Stealing All Those Paintings? ", gaining a true understanding of just who the art thieves are is a tricky proposition indeed. One of the interesting case studies is Silvia Loretti's look at Picasso and a pair of Iberian statuettes stolen from the Louvre; she argues that a reexamination of the evidences suggests that Picasso could have been prosecuted for having knowingly purchased stolen goods, and that a decent circumstantial case could be made that he was even more deeply involved in the thefts. Col. Giovanni Pastore of the Italian Carabinieri Division for the Protection of Cultural Heritage argues for an international ethical code that would require dealers and sellers of art to prove that the objects were free and clear. An interview with the security directors of the Isabelle Stewart Gardner and Tate Modern museums provided fascinating insight into the security procedures and mindsets at those key institutions. The most interesting section for those of a bookish worldview will be Part V, Libraries and Archives. Travis McDade gives a very useful introduction to the problem of thefts from libraries, including the very real risk posed to general, circulating collections by enterprising and nefarious thieves (ala Brubaker, Spiegelman, et. al). His concerns (particularly about the usual severe lag time between theft and discovery, and the problem of eBay and other online auction sites as the ultimate fence) are those that all of us who worry about these things are thinking about. McDade concludes by noting the slow strides being made to take book crimes seriously in federal courts (thanks in large part to the lack of latitude federal judges have in passing sentence), while lamenting the lack of progress in foreign courts and at the state/local level. Another essay of note in the libraries section is that of Richard Oram and Ann Hartley, who discuss the complicated process of returning stolen goods to their institutional homes. A valuable object lesson for sure, as the pair conclude: "... the experiences provides curators with a fascinating, if unsought, tutorial in the law of replevin and the inner workings of law enforcement and the book trade. Those who have lived through it pray that it is a once-in-a-lifetime education" (p. 181). A well-edited, useful, readable and (sadly) very much necessary collection. A brief respite from the bookish to point out a timely and well-meaning speech by Jim Leach, former GOP congressman and current chairman of the National Endowment for the Humanities. Delivered at the National Press Club in D.C. on 20 November, Leach's speech is "Bridging Cultures." You can read or watch it here (and thanks to E.J. Dionne for bringing the talk to my attention today in his column, "A courageous call for civility." "It is particularly difficult not to be concerned about American public manners and the discordant rhetoric of our politics. Words reflect emotion as well as meaning. They clarify - or cloud - thought and energize action, sometimes bringing out the better angels in our nature, sometimes lesser instincts. One might ask what problem is there with a bit of hyperbole. The logic, to paraphrase Marshall McLuhan, is the message. If we lost 400,000 soldiers to defeat fascism, spent a fortune and lost thousands to hold communism at bay, and fought a civil war to preserve the union, isn’t it a citizen’s obligation to draw on the humanities to lend perspective to words that contain warring implications? There is, after all, a difference between holding a particular tax or spending or health care view and asserting that an American who supports another approach or is a member of a different political party is an advocate of an 'ism' of hate that encompasses gulags and concentration camps. One framework of thought defines rival ideas; the other, enemies." Leach points out that spirited debate and "uncivil behavior" are nothing new: "What is new are transformative changes in communications technology, in American politics, and the issues facing mankind." He encapsulates some fairly recent (and to many minds unwelcome) changes in American political culture (including the under-representation of the center in Congress, the unrepresentative nature of the political party leadership, the presumed immorality of the opposing side in an argument, cultural ramifications of military policy, &c.) which have contributed to the state of things today, and suggests that things could and would work much better for "all legislators to consider themselves responsible for governing and for both sides to recognize that the other has something to say and contribute." In his concluding paragraphs, Leach notes "How we lead or fail to lead in an interdependent world will be directly related to how we comprehend our own history, values, and diversity of experiences, and how deeply we come to understand and respect other peoples and societies. Citizenship is hard. It takes a willingness to listen, watch, read, and think in ways that allow the imagination to put one person in the shoes of another. ... Civilization requires civility. Words matter. Just as polarizing attitudes can jeopardize social cohesion and even public safety, healing approaches such as Lincoln’s call for a new direction 'with malice toward none' can uplift and help bring society and the world closer together. ... If we don’t try to understand and respect others, how can we expect them to respect us, our values and our way of life?" He's right, of course, but it's incredibly heartening to hear it said. Jim Leach is one of the most intelligent and impressive thinkers in public life today, and frankly the country would be better off if there were hundreds more like him in the halls of power. Since we only have one, though, it's tremendously important that he continues to make his voice heard. It is easy to get caught up in the name-calling and hyper-partisan mania that infect so much of our political discourse today. A breath of reasonable fresh air is awfully nice now and then. - A really neat find in England: the deed separating Thomas Paine from his wife Elizabeth Ollive was discovered hanging in the West Sussex home of John Hughes; Hughes' brother found the deed in the late 1970s inside a Smollett novel removed from a shop basement. The deed sold for £11,000 at Bloomsbury on 19 November, purchased by the East Sussex records office and Lewes town council, with donations. - Some awesome things going on at LT these days (what else is new?) where SantaThing has taken off in a really cool way this year. Also, I'm working with the LT folks to organize a day-long ConferenceThing in Boston in January to coincide with ALA's Midwinter meeting. - The Bookshop Blog offers a Viking Q&A with Jasper Fforde, whose new book Shades of Grey is set for release just after Christmas. - The Shakespeare Quartos Archive debuted recently, with 32 copies of pre-1642 quarto editions of Hamlet available for digital comparison. - Ian's got a larger image of the 1813 Dance of Death bound in human skin that sold at the Boston Book Fair, as well as a Boston Herald short piece on the book. - Florence's History of Science Museum has found Galileo's two fingers and tooth, which have been missing since 1905. They'll go on display next year. - From Library Journal, "The Battle of the Books - Again" examines that oft-discussed topic du jour, the future of libraries. - Paul Collins notes the US release of Madeline Goold's Mr. Langshaw's Square Piano, and offers a clip of a Broadwood piano in action. - Robert Darnton was on "The Diane Rehm Show" this week to talk about The Case for Books and the future of books. Listen here. He's also got an NYRB essay this week, "Google and the New Digital Future" (about which more soon). - In the NYT Magazine, Caleb Crain excoriates the practice of "camel case," (that is, where capital letters appear in the middle of the work, as in iPod, or, hem hem, the name of this blog, sorry Caleb!). He's got an online bibliographical supplement here. - In a 12 November report [PDF], a task force on Harvard libraries concluded that the libraries must "move away from their fragmented and outmoded administrative and financial model." The system's "unwieldy governance no longer aligns well with the current needs of scholarship, where disciplinary boundaries have broken down and digital technology has created a virtual space that extends across the entire University and indeed, the entire world," the report notes. The Harvard Gazette reported that the provost has formed an "Implementation Work Group that will develop new funding and operating models for the library system." - An excerpt from his forthcoming book The Marketplace of Ideas, Louis Menand's Harvard Magazine essay "The Ph.D. Problem" examines the question of disciplinary professionalization and its impact on scholarship and knowledge, as well as the important questions of just what Ph.D. training in the humanities today gets you. - Word that the long-delayed Oxford Companion to the Book will be released in January 2010 in the UK; Amazon says March for this side of the pond. - At Wynken de Worde, Sarah muses on the future of the book and on the 'tension' between e-books and printed books (I agree with her, and many others, that the two are not mutually exclusive). - The "LJ Best Books 2009" list is out from Library Journal. In The Telegraph, Dominic Sandbrook offers his History books of the year; Benjamin Schwarz gives the Atlantic Books of the Year; the NYT has its 100 Notable Books of 2009 (of these, I've so far read a whopping three). Also in the Telegraph, a selection of folks pick their personal favorite book of the year, and in the TLS, a selection from their Books of the Year 2009. - At The Little Professor, Miriam Burstein reviews Hilary Mantel's Wolf Hall. - James Baker's Thanksgiving: The Biography of an American Holiday is reviewed by Alexander Nazaryan in the Washington Post. - John Milton Cooper Jr.'s Woodrow Wilson is reviewed by Erez Manela in the Boston Globe. - Jill Lepore reviews Gordon Wood's An Empire of Liberty in the Washington Post. Jay Winik reviews the book in the NYTimes. - Albert Mobilio reviews Umberto Eco's An Infinity of Lists at Bookforum. - Ben Yagoda's Memoir: A History is reviewed by Daniel Akst in the Boston Globe. Jonathan Yardley reviews the same book in the Washington Post. The results of the Dreweatt's/Bloomsbury London's sale of the collection of the late John Fane (26 November) are here. There were 109 lots of books, the top sellers of which were an imperfect copy of William Faden's A New General Atlas, c. 1818 (sold for £4,000); a lot about 160 titles, of Goethe and other 18th-century volumes, made £4,800; three boxes of 17th and 18th century Greek and Roman classics sold for £5,000; Jean Baptiste Du Halde's A Description of the Empire of China and Chinese-Tartary, 1738-1741, fetched £6,000. A 39-volume run of the London Magazine and Monthly Chronolger (1739-1777) sold for £5,000. The Sotheby's Paris sale of Books and Manuscripts on 26 November made a total of 993,713 Euros. Full results here. The highest spots were a volume of manuscript correspondence of the Princess Mathilde (96,750 Euros); a Paul Eluard manuscript of Le Temps Déborde (78,750 Euros); and a collection of Eluard correspondence (72,750 Euroes). I've been updating the upcoming auctions list here. If you're in need of a nice coffee-table book for the Bostonophile on your shopping list, you could do little better than Boston Beheld: Antique Town and Country Views (University Press of New England, 2008). The New England Historic Genealogical Society's D. Brenton Simons has gathered a marvelous, even stunning collection of 65 images of Boston (cityscapes, harbor views, and specific neighborhoods/buildings), to "capture the multifaceted and often picturesque character of a long-vanished town that has given way to a modern metropolis" (p. 1). In his introduction, Simons offers some of the most interesting and noteworthy descriptions of Boston from early visitors (flattering and otherwise), and his methodology in choosing the images (which come from a variety of institutional and private collections). Each of the plates is given pride of place on its own page, faced with a full description and a couple paragraphs of descriptive and explanatory text (well-researched, footnoted, and clearly written). The images are well chosen and beautifully reproduced. A fine volume, perfect for a good browse or an in-depth read. - A Painter's Life by K. B. Dixon (Inkwater Press, 2009). Author. - The Book: The Life Story of a Technology by Nicole Howard (Johns Hopkins University Press, 2009). Publisher. - The Devil in the Holy Water, or the Art of Slander from Louis XIV to Napoleon by Robert Darnton (University of Pennsylvania Press, 2009). B&N. - Horace Walpole's Strawberry Hill by Michael Snodin (Yale University Press, 2009). Publisher. Book Review: "A Painter's Life"
K.B. Dixon's A Painter's Life (Inkwater Press, 2009) mixes biographical sketches with journal excerpts, review snippets, and interview segments to tell the story (or select parts of the story) of Christopher Freeze, a struggling Portland artist. Freeze's meetings and interactions with his fellow artists, his art dealer, and a fellow attempting to write a book about him are detailed in the diary entries, as are (vaguely) his meetings with a therapist and his relationships with his wife, his friends, and his dog Wally. I liked the structure of the book (short chapters, each with little snips from the various forms), but the chronology proved confusing at times, as the biographical bits didn't always seem to match up with the journal entries and other excerpts. Overall, while the short book made for a brief diversion (it took me less than an hour to read) I didn't find it left me with very much to take away from it (the ending is completely ambiguous). Perhaps a slight change in the design (different fonts for the different forms, or slightly varying layouts) would have given a little more oomph to the interesting style. Book Review: "An Artist in Treason"
The name of one of the greatest traitors in American history is probably unknown to most people. His story is told in Andro Linklater's An Artist in Treason: The Extraordinary Double Life of General James Wilkinson (Walker, 2009). The most famous conspiracy with which Wilkinson was involved may be vaguely familiar to students of American history (this is the semi-nebulous plot spearheaded by Aaron Burr to invade Mexico and detach the western territories from the United States). As Linklater's book makes clear, though, this was just one episode among many in the fascinating, complicated and shocking career of James Wilkinson. From his earliest days in the army during the Revolutionary War, Wilkinson used his position as an aide to generals (Gates, Greene, Arnold) to curry favor, but made a habit of turning on his patrons as soon as it suited him. After getting caught out in this during the Conway Cabal fiasco Wilkinson found his future prospects for command and advancement in the Continental Army looking bleak, so he slunk away. A sly political operator, though, Wilkinson worked his contacts and got himself appointed clothier general, a position at which he proved uninterested and ineffective. This led George Washington to repeatedly call for his ouster, which was finally accomplished in 1781 (when Congress voted to cut his salary in half, prompting Wilkinson to resign). Decamping to the Kentucky frontier, Wilkinson became involved in an effort first to create an independent Kentucky government, and then with attempts to open the Mississippi River to trade by negotiating with the Spanish in New Orleans. Courting the Spanish imperial authorities with promises, Wilkinson in effect pledged to bring Kentucky into the orbit of Spain in exchange for trading rights, and arranged to receive payments from the Spanish in return for information and efforts on Spain's behalf in Kentucky (this became known as the Spanish Conspiracy). By December 1792, Linklater writes, Wilkinson was undoubtedly committing treason (he was drawing payments from Spain and providing them with vital information, while at the same time commanding an American army regiment). Linklater carefully documents the ways in which Wilkinson managed to undercut his personal, political and military foes, while flattering and courting those who could advance his career (most notably a whole string of secretaries of war and presidents from Washington to Jefferson). Notwithstanding a body of evidence and rumors regarding Wilkinson's treason (it was remarkably well known), those in power continued to reward him with duties, positions, and responsibilities. Jefferson in particular was surprisingly indulgent of Wilkinson, particularly after Wilkinson opted to betray Burr's plans to Jefferson even though he had been deeply involved in the plot from the very start. The number of times Wilkinson was almost brought down, and managed to right his ship by ruining the credibility of his accusers and telling well-crafted, outright lies about the nature of his relationship with the Spanish authorities, is astounding. That he was finally brought down at all ends up being something of a surprise: even after a disastrous loss of troops to illness during the early days of War of 1812 Wilkinson was granted command of the operations to take Canada; when this effort failed spectacularly he survived yet another court-martial (Linklater writes that contemporary jibes had it that Wilkinson "never won a battle, but never lost an inquiry") and was only cashiered during the wholesale downsizing of the military at the end of the war. Even this embittered Wilkinson, who fired off angry letters in every direction and published a three-volume memoir in defense of himself. He ended his days in semi-exile in Mexico, dying there in 1825. Some of the most breathtaking elements of Wilkinson's treason include his simultaneous memoranda to Jefferson and to his Spanish handlers instructing them (in practically opposite terms) how to deal with the American takeover of the Louisiana Purchase territory. Knowing of the Lewis and Clark expedition, for example, Wilkinson suggested to the Spanish that they might want to intercept the explorers (an attempt was made, but the effort failed). And Wilkinson's careful (and occasionally hysterical) efforts to protect his treason were of great interest: his payments were sent upriver hidden in barrels of foodstuffs, and he and his handlers used ciphers and codes to communicate with each other (an appendix documents some of the codes). Linklater's book contains a few more than usual errors of the typographic variety, and he missteps (p. 188) in calling Burr the Federalist candidate for president in 1800 (John Adams was running for reelection, of course; Burr was ostensibly the Republican candidate for vice-president, but ended up being Jefferson's strongest competitor when the electoral college vote resulted in a tie and threw the election to the House). These aside, this is a good survey of Wilkinson's life and treasons. Vile he may have been (this is by no means a hagiography), Wilkinson's abilities to dissimulate and keep himself in the good graces of those who mattered were prodigious. Anna at A Summary View has this Thanksgiving's must-read post, as she busts some myths on the Founding Fathers and their views about turkeys. And for your viewing pleasure, here's the official White House turkey pardoning ceremony from yesterday. I really enjoy that our president can riff a little on the absurdities: "You know, there are certain days that remind me of why I ran for this office. And then there are moments like this, where I pardon a turkey and send it to Disneyland." I don't think I've groused recently about how much I hate Google Book Search's snippet view, which for auction records provides just enough information to tantalize but not enough to be able to figure out the specific sale/volume/&c. to actually be able to find the record. Gah. Anyway, I'm looking for this one; if anyone happens to have any 1972 Parke-Bernet sale catalogs handy, would you mind checking p. 42 and seeing if it contains information relating to an Alexander Hamilton book? If so, I'd be more than delighted to know what the full record says, and what the sale was. The auctions are coming so fast and furious these days I'm having a hard time keeping track of them all! - The 23 November Christie's London sale of Fine Printed Books, Manuscripts, and Traditional Sports made 502,912 GBP (full results here). Sigmund Freud's walking sticks (lot 139, $3800-5300) made $7,876; the Leo Africanus's, De Totius Africae descriptione, 1556, of which only two copies have sold at auction since 1975 (lot 235, $4600-7500) sold for $6,218; Gervase Markham's Cavelarice, or The English Horseman, 1607 (lot 54: est. $3100-4500) fetched $3,109; the presentation copy of Evelyn Waugh's Mr Loveday's Little Outing, 1937, made $2,694. The book high spots were two lots of Pushkin, which each made $22,758 (Lots 304 and 305). - At today's Christie's sale of Valuable Manuscripts and Printed Books, Lot 5, a c. 1470 illuminated manuscript on vellum of Petrarch's Il Canzoniere and I Trionfi and related works (est. $498,300-664,400), made $578,707. Lot 44, Bartolommeo Dalli Soneti's Isolario (c. 1485/6), the first printed edition of the first maritime atlas, sold for $151,201. Lot 46 the four-volume Narrative of the Surveying Voyages of His Majesty's Ships Adventure and Beagle (London: 1839), made $35,211; lot 47 (one of just 15 copies of Darwin's On the Connexion of Certain Volcanic Phenomena in South America) sold for $26,926. Lot 48, a beautiful copy of the first edition of Origin, made $171,085 (better than doubling its estimate on the 150th anniversary of its publication. Lot 7, the 1547 illuminated manuscript of Olivier de la Marche's Le Chevalier délibéré (Lot 7, est. $581,350-830,500), and Lot 43, the colored Blaeu atlas (1649-55), did not sell. - The De Orbo Novo Collection: Exploration in the New World, 1492-1625 at Bloomsbury New York, 3 December. 81 lots. - The William E. Self Library at Christie's New York, 4 December. 197 lots. - Fine Printed Books and Manuscripts including Americana at Christie's New York, 4 December. 258 lots. - The Wolfgang A. Herz Library: Important Voyages and Travels at Christie's New York, 9 December. 340 lots. - Music and Continental Books and Manuscripts at Sotheby's London, 8 December. 257 lots. - Capture the Imagination: Original Illustration and Fine Illustrated Books at Bloomsbury New York, 9 December. 365 lots. - Bibliophile sale at Bloomsbury Godalming, 10 December. 459 lots. - Fine Books and Manuscripts at Sotheby's New York, 11 December. 276 lots. - Books, Maps, & Manuscripts; Historical Photography at Bonhams New York, 15 December. 562 lots. - English Literature, History, Children's Books & Illustrations at Sotheby's London, 17 December. 182 lots. Many interesting things in these sales, and I hope to be able to preview them before they happen, time permitting. I really am starting to dislike the new Sotheby's catalogs, which are slow to load, hard to sort and hard to link to. Christie's definitely wins that battle. Via Everett Wilkie on ExLibris: "The German Society of Pennsyvania reports the following four books are missing from their collection. If you have any information about them, please contact Violet Lutz (librarian@germansociety.org). Although I do not know for sure, I suspect these books all have GSP markings in them. --ECW"
Allen, Paul (ed.). History of the expedition of Captains Lewis and Clark to the sources of the Missouri, performed during the years 1804-5-6. Philadelphia: Bradford and Inskeep, 1814. Gunn, Thomas Butler. The physiology of New York boarding houses. New York: Mason Brothers, 1857; ill.
Nichol, J. P. Views of the architecture of the heavens, in a series of letters to a lady. New York: Dayton & Newman, 1842; 2 fold. charts. Ward, Mrs. Humphrey. Marcella. New York: Macmillan and Co., 1894; port. 2 vols. Book Review: "Lives Shaped by the American Revolution"
Jeannine Falino's Lives Shaped by the American Revolution: Portraits of a Boston Family (Harvard University Art Museums, 2005) highlights a collection of twelve family portraits which ended up in the possession of Catherine Coolidge Lastavica (some have now been given by her to various museums). Thank goodness for the genealogical chart printed on the endpapers of this volume; without it the reader would have no chance at figuring out the connections between the sitters. As Jeanine Falino says in the first sentence of the text, "It is often said among art historians and genealogists who specialize in the history of colonial New England that the early settlers were all related to one another" (p. 13). The intertwined Speakman, Rowe, Inman, Linzee, Coffin and Amory families as outlined in the charts speak directly to this, and also, as Falino continues, "For those willing to look deeply into these portraits and the lives of their subjects, there is a fascinating story to be learned about American life in the eighteenth and nineteenth centuries." Falino's narrative briefly limns the lives and fortunes of the families whose portraits appear here, drawing on official records, genealogical accounts, family correspondence and papers (including John Rowe's diaries, the originals of which are at MHS, as are the Amory Family papers and other associated materials). Each of the twelve portraits (ranging across four generations of these families) is described in detail and reproduced in a high-quality color image. Lastavica provides a useful preface to the book, outlining the descent of the portrait collection through her grandmother's family, and William Adair provides a short essay on the history of the frames on the portraits and their historical significance. One of my favorite stories associated with this family is the union of Susan Amory with the great historian William Hickling Prescott, which resulted in the crossing of Amory's grandfather John Linzee's sword with that of Prescott's grandfather John Prescott (the two had been on opposing sides during the Battle of Bunker Hill). The swords hung crossed in the Prescott family home, and are now at MHS, still crossed. A neat introduction to American art and the complications of New England genealogy. Book Review: "The Grandeur of Life"
The Grandeur of Life: A Celebration of Charles Darwin and the Origin of Species, by William B. Ashworth, Jr., accompanies an exhibit by the same name at the Linda Hall Library (Kansas City, MO). In just 91 pages (including index and bibliography) this short catalog provides a short but useful overview of natural history scholarship from the dawn of printing through 24 November 1859, when Darwin's Origin was published. The 57 items included in the catalog are each described in some detail, including information on authors, illustrators and illustrative processes, publication, and sources for the work. Each example is accompanied by several excellent images, usually a detail from the work. The catalog includes a wide range of works, covering the usual botany and zoology as well as the emerging fields of what we now know as geology, paleontology, and biogeography. The final section includes Darwin's pre-Origin publications, as well as earlier works postulating some elements of evolutionary processes. The Pittsburgh Tribune-Review reports that the books were discovered at the Brooklyn home of Mary Kolompar, 64, an internationally-known art thief with more than twenty aliases and a criminal record dating back to the late 1970s. Brooklyn police served a search warrant on Kolompar's home on 14 November (investigating charges of counterfeiting and welfare fraud), and found there the stack of rare Civil War books listed here. Brooklyn detective Kevin McFadden says authorities also found jewelry and sports memorabilia, and Kolompar has been charged with 10 crimes to date. But since the source of the books remains unknown, they've been unable to charge Kolompar with their theft, or to return the books to their owner. - First, a hilarious takedown of an incredibly ridiculous eBay listing, by Book Patrol's Stephen Gertz. This seller was attempting to sell an ex-lib, later edition of Mahan's The Influence of Sea Power Upon History (albeit one from the Department of Defense Library) as "Legitimate Contender World's Most Expensive Book," for $21 million. Wow. - The next hearing on the Google Books Settlement will be 18 February 2010, according to a report in today's Independent. Opponents will have until 28 January to lodge complaints, and the Justice Department must weigh in before 4 February. The Open Content Alliance has collected a bunch of quotes from people opposing the revised settlement deal, and offers its own "post-mortem" on the settlement revision. - From McSweeney's, Christopher Robinson offers up "Captain Blackbeard's College of Piracy - Ye Olde Course Catalogue, Spring '10." - John Overholt notes a new Houghton Library website, Picturing Prayer: Books of Hours in Houghton Library, Harvard University, which had its roots in a 2006 exhibition. John also found a little anti-Johnson ditty in the back of a book in the Hyde Collection. - Ian offers up his report from the trenches from last weekend's Boston Book Fair. - Book Patrol offers up a list of their top books about books for 2009. - Now that it's been published, the mss. (on index cards) of Nabokov's The Original of Laura will be going up for auction, at Christie's on 4 December (est. $400,000-600,000). I'll have a preview of this sale in a few days. - In Collectors Weekly, an interview with Ken Sanders. Incidentally, the books section of Collectors Weekly is pretty nifty; I've added a sidebar link. - David Aronovitch writes in the Times about spending a day with the anti-Stratfordians (those who believe Shakespeare didn't write Shakespeare). - Woody Holton's Abigail Adams is reviewed by Paul Nagel in the Boston Globe. - Jonathan Yardley reviews Joan Waugh's U.S. Grant: American Hero, American Myth in the Washington Post. - In the NYT, Judith Shulevitz reviews Ben Yagoda's Memoir: A History. The same book is reviewed by John Gross in the WSJ. - Also in the Times, Sean Wilentz reviews Robert Merry's A Country of Vast Designs. - Alexandra Mullen reviews Madeline Goold's Mr. Langshaw's Square Piano in the WSJ. - Barbara Kingsolver's The Lacuna is reviewed by Liesl Schillinger in The Scotsman. Book Review: "Liberty & the American Revolution"
Liberty & the American Revolution: Selections from the Collection of Sid Lapidus (Princeton University Library, 2009) is the catalog to accompany an exhibit of the same name now on display at Princeton's Firestone Library (through 3 January 2010). If the catalog is any indication, the exhibit itself is undoubtedly quite a show, and I certainly urge anyone who can get there to go to Princeton and see this remarkable collection of materials. These 157 items (broadsides, books, prints, but mostly pamphlets) are drawn from Sid Lapidus' 2,500-item collection relating to the "intellectual origins of the American Revolution; the Revolution itself; the early years of the republic; the resulting spread of democratic ideas in the Atlantic world; and the effort to abolish the slave trade in both Great Britain and the United States." The body of the catalog comprises four major sections: Revolutionary Origins, The American Crisis, Contagious Liberty, and Abolition of the Slave Trade. These are further subdivided into categories, which contain several works apiece; each work is introduced with a short contextual paragraph about the author and the text, followed by an appropriate selection from the text. Most of the items are accompanied by a high-quality image of the title page, a relevant passage, or the binding. Curator of Rare Books Stephen Ferguson provides a preface to the volume, noting that the exhibited materials should be viewed within at least three separate 'frames' (the story of expanding liberty in the Atlantic world, a narrower frame such as the specific events or topics discussed in the work, and finally the item itself as physical object). In his foreword Sid Lapidus, the collector, discusses his background as a book collector, musing on how this collection came to take shape and offering much insight into the mind and methods of a truly dedicated, interested and serious collector. He writes about his process of purchasing, of his delight in perusing well-researched dealer and auction catalogs, and of how the creation of his collection has been "a voyage of discovery of part of me I didn't know existed" (p. xxi). This short essay alone would make this catalog worth reading for any collector, since it gets to the heart of what many of those of us who enjoy collecting enjoy about it. Sean Wilentz, who holds the Sidney and Ruth Lapidus Professorship in the American Revolutionary Era at Princeton, provides a worthy introduction to the catalog, laying the groundwork and providing much important contextual information to the materials included in the exhibit. This is a succinct and able encapsulation of the themes illustrated by the exhibited texts, and is as good a short summary of the ideas of liberty and rights during the Revolutionary era as any I've read. This catalog is set in a very appropriate and frankly quite beautiful font, and is extremely well designed (even with a very useful and comprehensive index). It is a lovely complement to Mr. Lapidus' work, and will be a lasting testament to this small portion of his notable and extensive collections (and will stand in its own right as a useful bibliographic resource). 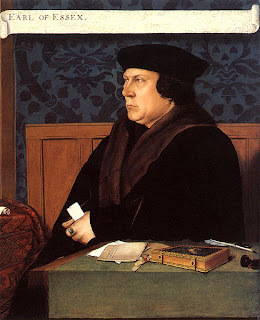 Hilary Mantel's Wolf Hall, this year's Booker Prize-winning novel (published in the U.S. by Henry Holt, 2009), is the first of two volumes covering the life and times of Thomas Cromwell, a sometime trusted advisor to Henry VIII (typically portrayed as something of a villain). I've included his picture here (by Hans Holbein) since it ends up playing something of a role in the book. This volume, which takes the reader through Cromwell's rise up to the summer of 1535, ends with the execution of Sir Thomas More; the next (which Mantel has said she hopes to publish in "a couple of years") will encompass the final five years of Cromwell's life (culminating in his precipitate fall from grace). While I found myself occasionally thinking that this book was plodding along, it was the good sort of plod, the sort that I think must accurately depict anyone's life (even one as fraught with intrigue, politics, and moments of import as Cromwell's was). Mantel has ably captured, I think, the state of Henrician England during the 1530s, as the king sought to put aside Wife # 1 (Katherine of Aragon) and her daughter for Wife # 2 (Anne Boleyn). The ensuing debate, which of course rippled across the political and cultural landscape of not just the British Isles of all of Europe as well, is the stuff of hundreds if not thousands of books, but Mantel has synthesized it remarkably through Cromwell's viewpoint. Mantel's book can be read by the general reader, but those with some knowledge and understanding of the history of the period will probably get more out of it, as the author offers up much historical context, background and foreshadowing in what might appear to be casual asides. It's also handy to keep a search window up nearby, so you can check names, titles, dates, or topics of interest as you go (or look for images of the characters, which I rather like to do). Much has been made of Mantel's decision to use "he" to refer almost always to Cromwell, which creates a degree of grammatical ambiguity at times. I didn't find this device as annoying as I feared I might, although it was confusing at times when it wasn't clear just who "he" was supposed to be (it's not always Cromwell). The texture and detail which Mantel brings to the Tudor court with this book is an absolute delight. Her discussions of contemporary events through the eyes of her characters are illuminating, and her portrayal of Cromwell is simply fascinating. I'll look forward to the next volume with impatience. This one's too good to save for tomorrow's links post: from Mercurious Politicus, Nick discusses the potential creation of an entire Cromwell, "Frankenstein's monster-style." Well played! Here's what arrived this week. - The Passionate Empiricist: The Eloquence of John Quincy Adams in the Service of Science by Marlana Portolano (SUNY Press, 2009). Book cart. - Romance, Remedies, And Revolution, 1773-1775: The Journal of Dr. Elihu Ashley of Deerfield, Massachusetts; edited by Amelia F. Miller and A.R. Riggs (University of Massachusetts Press, 2007). Book cart. - Subjects unto the Same King: Indians, English, and the Contest for Authority in Colonial New England by Jenny Hale Pulsipher (University of Pennsylvania Press, 2005). Book cart. - Boston Beheld: Antique Town and Country Views by D. Brenton Simons (University Press of New England, 2008). Book cart. - Beyond the Revolution: A History of American Thought from Paine to Pragmatism by William H. Goetzmann (Basic Books, 2009). Book cart. - The Sedgwicks in Love: Courtship, Engagement, and Marriage in the Early Republic by Timothy Kenslea (Northeastern University Press, 2005). Book cart. - Lincoln and the Decision for War: The Northern Response to Secession by Russell A. McClintock (University of North Carolina Press, 2008). Book cart. - Transatlantic Encounters: American Indians in Britain, 1500-1776 by Alden T. Vaughan (Cambridge University Press, 2006). Book cart. - Lives Shaped by the Revolution: Portraits of a Boston Family: Speakman, Rowe, Inman, Linzee, Coffin & Amory by Jeannine J. Falino (Harvard University Art Museums, 2005). Book cart. - The Secrets of Tomb 10A by Rita Freed et al. (Museum of Fine Arts, 2009). Book cart. - The Boston Athenaeum: Bicentennial Essays; edited by Richard Wendorf (Boston Athenaeum, 2009). Amazon. - The Infinity of Lists: An Illustrated Essay by Umberto Eco (Rizzoli, 2009). Publisher. - Art and Crime: Exploring the Dark Side of the Art World; edited by Noah Charney (Praeger, 2009). Publisher. Are you Missing Some Books? "November 2009 - The New York Police Department has recovered a collection of rare Civil War Era books in the possession of a known thief. The books are believed to be stolen, though the loss has not been reported to the Art Loss Register or the Antiquarian Booksellers' Association of America. All nine books likely came from the same collection. If you have information on this collection, please contact Detective Michael McFadden of the NYPD at michael.mcfadden@nypd.org or the Art Loss Register at stolen@alrny.com." - For the PBA Rare Books and Manuscripts sale on 19 November, full results are here. The expected high spots did not sell. The top prices were $9,600 for Lot 135 (a first edition in English of Plato's Republic, 1763); $7,800 for Lot 159 (a first edition in English of Virgil's Aeneid, 1562); and $7,200 for Lot 138 (a presentation copy of Karl Popper's The Open Society and its Enemies, 1945). Some upcoming Sotheby's sales include Books and Manuscripts in Paris on 26 November and Western Manuscripts in London on 8 December. In the former, some very interesting books with French royal provenance, a neat selection of books on orchids, and some tremendously interesting bindings. In the latter, just 53 lots, but what 53 lots! A miniature, showing silver mining in Bohemia, which formed the frontis of an illuminated manuscript choirbook (lost since the 1920s and probably not exhibited publicly since the Middle Ages, est. 200,000-300,000 GBP); the missing volume of the Grammont Abbey Missal (est. 100,000-150,000 GBP); an illuminated copy of the gospels in Greek from the 12th century (illuminated late in the 14th), est. 80,000-120,000 GBP; a pre-Wycliffe English translation of the Psalms by Richard Rolle, est. 40,000-60,000 GBP (this once owned by Thomas Phillipps); some classical fragments, and several other really interesting goodies. Do check out this catalog. New York Public Library president Paul LeClerc said on Wednesday that he will step down in the sumer of 2011, the NYTimes reports. LeClerc has been with NYPL since December 1993 (his is the longest tenure of any NYPL president). NYPL board chair Catherine Marron and vice chair Joshua Steiner will head a search committee to find LeClerc's replacement, and "said that the new leader could come from any number of fields — academics, technology, the nonprofit sector." Eminent historian Gordon S. Wood has an essay in yesterday's Washington Post that every practicing historian (or would-be practicing historian) ought to read. He makes the very good point that the oft-heard argument that academic historians have "forgotten how to tell a story" (and thus, write books that very few people actually sit down and read) is not quite accurate: "Academic historians have not forgotten how to tell a story. Instead, most of them have purposefully chosen not to tell stories; that is, they have chosen not to write narrative history." Instead, he notes, academic historians tend to write analytic history, "specialized and often narrowly focused monographs" which "seek to solve problems in the past that the works of previous historians have exposed; or to resolve discrepancies between different historical accounts; or to fill in gaps that the existing historical literature has missed or ignored." Wood continues: "Their studies, however narrow they may seem, are not insignificant. It is through their specialized studies that they contribute to the collective effort of the profession to expand our knowledge of the past." He points out the roots of this type of history writing ("the 19th-century noble dream that history might become an objective science"), and maintains (correctly) that as a group these histories have "advanced the discipline in extraordinary ways over the past century." But, he goes on, this type of writing comes at the price of a limited readership: "Like papers in the other sciences, monographic history is written largely for people within the discipline. Since the monographs build upon one another, the writers of these monographic studies usually presume that readers will have read the earlier books on the same subject; that is, that they will possess some prior specialized knowledge that will enable them to participate in the conversations and debates that historians have among themselves. This is why most historical monographs are often difficult for general readers to read; new or innocent readers often have to educate themselves in the historiography of the subject before they can begin to make sense of many of these books." Wood concludes "So advising academic historians that they have to write more stimulating prose if they want to enlarge their readership misses the point. It is not heavy and difficult prose that limits their readers; it is rather the subjects they choose to write about and their conception of their readership as fellow historians engaged in an accumulative science." Because of the massive accretion of academic monographs, "most academic historians have tended to throw up their hands at the possibility of synthesizing all these studies, of bringing them together in comprehensive narratives. Thus, the academics have generally left narrative history writing to the non-academic historians, who unfortunately often write without much concern for or much knowledge of the extensive scholarship that exists. If academic historians want popular narrative history that is solidly based on the monographic literature, then they will have to write it themselves." Wood's concerns aren't new: much of the background in this piece will be familiar to readers of his excellent reviews, which were collected in a 2008 volume, The Purpose of the Past (my review here). And writing as an academic historian who can and does engage in the synthesis of scholarly literature in a way that is at once readable and rigorous, as in his new book, Empire of Liberty (my review here), Wood understands as well as anyone that it can be done. But beyond that, scholarly monographs can be readable and interesting too, and that should be something all scholars strive for. The AP reports today that the last major collection of FDR's presidential papers "may soon be available to researchers and the public," pending the final passage of legislation relinquishing government claims to some of the documents. The fourteen-box collection, accumulated by FDR's secretary, Grace Tully, was purchased by Sun-Times Media Group Inc. in 2001 for $8 million. The group is prepared to donate the materials to the FDR Presidential Library and Museum, but the National Archives claims it already owns parts of the collection (including FDR's notes to Tully). In order for the donors to receive a full tax deduction, that claim must be settled. So the legislation states that "any claim of the United States to such property shall be treated as having been waived and relinquished on the day before the date of such gift." The legislation passed the Senate by unanimous consent in October, and was agreed to by voice vote in the House yesterday. The Senate must act once more, and then the bill will go to President Obama for his signature. Once the legislative process is completed the 5,000 documents should be available as soon as the archivists at the FDR library can process them. - Lot 96 (a David Hume letter regarding Rousseau's letters to him, est. $10,000-15,000), sold for $18,368. - Lot 131 (a fantastic Martin Luther letter, est. $15,000-25,000), fetched $106,650. - Lot 151 (an Isaac Newton manuscript on ancient European history, est. 10,000-15,000), made $21,330. - Lot 187 (two manuscript pages of Thoreau's A Week on the Concord and Merrimac Rivers, est. $4,000-6,000), sold for $21,330. Lot 17 (a lock of the hair of John Brown, est. $5,000-7,000, picture on p. 11 of the catalog); Lot 179, a large collection of material relating to Albert Schweitzer (est. $35,000-55,000); and Lot 184 (a Peter Stuyvesant letter, est. $20,000-30,000) did not sell. - Lot 204, a Walt Whitman signed and corrected printed folio proof sheet, sold for $17,775. - Lot 331 (a set of early printings of Lewis Carroll's Wonderland works, bound uniformly, est. $3,500-4,500) sold for $5,925. - Lot 359 (a five-volume set of Gould's Birds of Great Britain, est. $60,000-80,000) fetched $56,288. - Lot 363 (a book from the library of Nathaniel Hawthorne, est. $2,000-3,000) beat the estimate, going for $7,703. - Lot 397A (a first English edition of Jefferson's Notes on the State of Virginia, est. $20,000-30,000) made $21,330. - Lot 575, Audubon's Carolina Parakeet, (est. $25,000-35,000) made $38,513. - Lot 602 (a 1705 Visscher atlas, est. $10,000-15,000) fetched only $5,333. - Lot 617 (a famous and excellent 1755 map of North America, est. $15,000-20,000) sold for $65,175. Lot 601 (a 1574 Sebastian Munster world atlas, est. $10,000-12,000) failed to sell. Back from the big Boston International Antiquarian Book Fair, after a very nice few days over at the Hynes. I went by Friday night for the first browse, was there Saturday to work at the RBMS and Ticknor Society tables, and made another quick visit today to buy the item that caught my eye. I thought it was a good fair; the usual suspect dealers were there, although there were a few conspicuous absences (including Oak Knoll, which rather surprised me). It was a real delight to be able to talk bindings with Ian Kahn and Sid Berger, recruit a new bunch of Ticknorites, browse the aisles, catch up with old friends (dealers, plus folks from the AAS, Athenaeum and other places) and make new ones. While the crowd on Friday night seemed slightly thinner than usual, and Saturday's deluge probably kept a few people away, there appeared to be a fairly steady stream of folks moving through. The book bound in human skin (offered by James Cummins and sold before the fair even opened) was probably the top draw (it stayed on display for a while). It was a fantastic binding, and the endpapers (also human skin) showed the pores quite clearly. Kinda creepy, but very interesting. 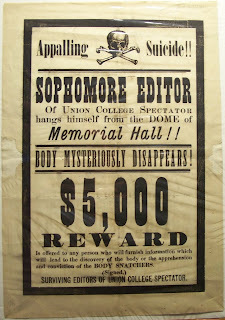 I ended up with a surprising little find: from Savoy Books (Lanesboro, MA), a broadside relating to the hanging-in-effigy of the editor of the College Spectator, a student publication at my alma mater which preceded Concordiensis (the current student paper, which I edited while at Union). The Spectator was published between April 1872 and December 1875, and during the middle of its final year the freshmen and sophomores had a squabble (which led to the editor's suspension from the dome). Can't beat a good hanging (in effigy), right? - In the Globe today, Sarah Schweitzer writes on the Boston Athenaeum and its marketing efforts to attract new, younger members. - David Ferriero was confirmed by the Senate on 5 November as the tenth Archivist of the United States. - Michael Lieberman notes there's a board game for the bibliophile on your Christmas list: Bookchase. I'd be interested to see the types of questions they've got, anyway. - In The Guardian, an interview with McSweeney's editor Dave Eggers about the next issue, which will be in the form of a full-size Sunday newspaper. - Lewis & Clarkiana collector Roger Wendlick is profiled in The Oregonian. Roger was also featured on a very good "This American Life" episode this summer, "The Book That Changed Your Life." - John Overholt points out a new Houghton Library online exhibition, "History of the Harry Elkins Widener Memorial Collection." A very classy presentation about a truly great collector. - Over at Past is Present, the AAS' Diann Benti offers up "the anatomy of a catalog record." - In The Telegraph, ten weird facts from the original Encyclopaedia Britannica. - David Liss' The Devil's Company is reviewed by Virginia A. Smith in the Boston Globe. My review here. - Arifa Akbar reviews Barbara Kingsolver's The Lacuna for The Independent. - In The Scotsman, Zoe Coutts reviews Robert Darnton's The Case for Books. - Nabokov's The Original of Laura, recently published in its unfinished form, is reviewed by David Gates for the NYTimes, and by James Marcus in the LATimes. - Also in the Times Harold Bloom reviews Peter Ackroyd's new adaptation of Chaucer's Canterbury Tales. - In the TLS, Robert Douglas-Fairhurst reviews Andrew Lambert's Franklin: Tragic Hero of Polar Exploration and Glyn Williams' Arctic Labyrinth. - Noah Malcolm reviews Toby Lester's The Fourth Part of the World in The Telegraph. - McSweeney's Quarterly Concern Nos. 15, 16, 17, 18, 20, 24, 25. (McSweeney's, 2005-2007). Publisher. - The Grandeur of Life: A Celebration of Charles Darwin and the Origin of Species. An Exhibition of Rare Books from the History of Science Collection, Linda Hall Library; text by William B. Ashworth, Jr. (Linda Hall Library, 2009). Mail. - Maps and Legends by Michael Chabon (McSweeney's, 2008). Publisher. - Paul Revere's Engravings by Clarence S. Brigham (AAS, 1954). Brattle. - Borges: Selected Non-Fictions by Jorge Luis Borges (Penguin, 2000). Brattle. - The Monuments Men: Allied Heroes, Nazi Thieves, and the Greatest Treasure Hunt in History by Robert M. Edsel (Center Street, 2009). Brattle. - Nature's Ghosts: Confronting Extinction from the Age of Jefferson to the Age of Ecology by Mark V. Barrow Jr. (University of Chicago Press, 2009). Brattle. - The Anti-Federalist Writings of the Melancton Smith Circle; edited by Michael P. Zuckert and Derek A. Webb (Liberty Fund, 2009). Publisher. - Boyle: Between God and Science by Michael Hunter (Yale University Press, 2009). Publisher. - Bugs and the Victorians by John F. Clark (Yale University, 2009). Publisher. As expected, Google and its partners released the revised Google Books Settlement yesterday afternoon. You can read the whole 173-page behemoth here [PDF], and the NYT offers a summary. "The revisions to the settlement primarily address the handling of so-called orphan works, the millions of books whose rights holders are unknown or cannot be found. The changes call for the appointment of an independent fiduciary, or trustee, who will be solely responsible for decisions regarding orphan works. The trustee, with Congressional approval, can grant licenses to other companies who also want to sell these books, and will oversee the pool of unclaimed funds that they generate. If the money goes unclaimed for 10 years, according to the revised settlement, it will go to philanthropy and to an effort to locate rights holders. In the original settlement, unclaimed funds reverted to known rights holders after five years. The changes also restrict the Google catalog to books published in the United States, Britain, Australia or Canada. That move is intended to resolve objections from the French and German governments, which complained that the settlement did not abide by copyright law in those countries. The revised settlement could make it easier for other companies to compete with Google in offering their own digitized versions of older library books because it drops a provision that was widely interpreted as ensuring that no other company could get a better deal with authors and publishers than the one Google had struck." Google Books Engineering Director Dan Clancy says in a blog post "We're disappointed that we won't be able to provide access to as many books from as many countries through the settlement as a result of our modifications, but we look forward to continuing to work with rightsholders from around the world to fulfill our longstanding mission of increasing access to all the world's books." There's also a Summary of Revisions, and an FAQ about the changes (both PDF). Judge Denny Chin will now schedule a "fairness hearing" on the revised settlement, and the Justice Department is reviewing the revisions. Opponents of the plan don't seem entirely placated: the Open Content Alliance calls the revisions "a sleight of hand; fundamentally, this settlement remains a set-piece designed to serve the private commercial interests of Google and its partners. ... By performing surgical nip and tuck, Google, the AAP, and the AG are attempting to distract people from their continued efforts to establish a monopoly over digital content access and distribution; usurp Congress’s role in setting copyright policy; lock writers into their unsought registry, stripping them of their individual contract rights; put library budgets and patron privacy at risk; and establish a dangerous precedent by abusing the class action process." We'll see - the saga continues! The papers from the Grolier Club's "Books in Hard Times" conference, which I recapped here, are now available online, in PDF form. Recommended reading for all. - At the Sotheby's London sale of Travels, Atlases and Natural History on 10 November, the total take was 1,425,825 GBP. A fair portion of that was Lot 43, a watercolor album commissioned by Gdansk's Bartell Schachman, 1590. Looks like a pretty spectacular item, and it sold well, fetching £361,250. Lot 161 is also very interesting; a 16/17th century herbarium containing more than 700 botanical specimens, with Latin and German captions and hand-colored illustrations. That made £67,250. Full results here. Lots of auctions on the horizon. In addition to those previewed here, PBA Galleries will sell Rare Books & Manuscripts in 163 lots on 19 November. Expected highlights include a first edition (1712) of Isaac Newton and John Collins' Commercium epistolicum, a defense of Newton's priority in the Great Calculus Debate (est. $20,000-30,000); a c. 1550 London edition of the works of Chaucer (est. $10,000-15,000); and a bunch of other interesting things. If you needed another reason to be concerned about the state of the planet, check out the absolutely horrifying pictures here, of Midway Island albatross chicks killed by plastic bits their parents thought was food. Book Review: "McSweeney's, Vol. 17"
McSweeney's 17 is a bundle of mail. That's right, a bundle of mail (addressed to Maria Vasquez of Arlington, VA), rubber-banded together. A full color advertisement flyer for Pantalaine ("Provisioners of America's Finest Plural Clothing") surrounds the rest of the pile, which includes a brochure for Tyrolian Harvest gift baskets, some "snail mail spam" from a Bangladeshi widow, a very odd legal document containing many pictures of red cars and dead fish, a prospective periodical of "very new artwork" (Envelope), and two journals: Yeti Researcher ("The magazine of the Society for Cryptic Hominid Investigation") and Unfamiliar ("a twice monthly magazine of different fiction"). Very imaginative, and quite entertaining. It must be so fun to sit around and come up with ideas for things like this! While some of the short stories in Unfamiliar were a little bizarre, the rest of the packet was fascinating to read through. Kudos, McSweeney's folks. The Boston International Antiquarian Book Fair will be this weekend (Friday 5-9; Saturday 12-7; Sunday 12-5) at the Hynes Convention Center. Check out the activities, browse the list of exhibitors and cultural partners, and view some highlights. I'll be at the fair most of the weekend, including shifts at the RBMS and Ticknor Society tables on Saturday. - The Boston Book, Print & Ephemera Show will be held at the Radisson from 9-4 on Saturday. Info here. - The Skinner auction will begin at 11 a.m. on Sunday morning. I've done a preview of that sale, here. - from Philadelphia Rare Books & Manuscripts, a beautiful list of books about books (my favorite, of course) and a list of post-1820 Americana. I love to read their lists - if there were awards for the best book catalogs/lists (you know, maybe there should be ...) , PRB&M would have to be considered the heavy favorite in many, many categories. - from Justin Croft, a list of French Books & Manuscripts (PDF). - from Thomas A. Goldwasser, Americana and World Figures, plus Literature (PDF). The latter includes an 1803 Thomas Jefferson letter priced at $250,000; a copy of Pope's works once owned by Jefferson ($17,500); and a pair of interesting George Washington letters. - from Lorne Blair, a list of books to be offered at the Boston Book Fair (more on which later this morning). List in PDF. - from Oak Knoll, the reference library of the Zaehnsdorf Company. The AP is reporting that twelve people have been indicted in Prince George's County, MD for the theft of textbooks from the county library system. "Prince George's County authorities said the suspects, at least some of whom were related [and who range in age from 20 to 51], withdrew close to the limit of 75 books from 12 of the library system's 18 locations. Each is charged with theft over $500 and faces a maximum penalty of 15 years in prison." Authorities said local colleges were also hit, with the total worth of stolen items approaching $140,000. "'They're traveling quite far and wide for the little bit of money they get,' said Mary Eilerman, chief of security at Harford Community College, also victimized. 'They were ripping off the bar codes and handing them over to book consignment shops as quickly as they could.' Eilerman said a $100 textbook would yield about $3 or $4 at a consignment shop. She said one of the suspects told her she was using the cash from the thefts to buy Ecstasy." I'm surprised we're not seeing more of this, frankly. In Sunday's Guardian, Germaine Greer asks "Why do people gush over Proust?" She begins her column with this barn-burner of a paragraph: "If you haven't read Proust, don't worry. This lacuna in your cultural development you do not need to fill. On the other hand, if you have read all of A la Recherche du Temps Perdu, you should be very worried about yourself. As Proust very well knew, reading his work for as long as it takes is temps perdu, time wasted, time that would be better spent visiting a demented relative, meditating, walking the dog or learning ancient Greek." Greer goes on to criticize Proust's editors, translators, and gushers, but particularly his grammatical style: "If Proust did not make such a snobbish to-do about diction, it might be easier to forgive him for his battering of the sentence to rubble and his apparent contempt for the paragraph. He relies on commas and semi-colons to do what should be done by full-stops, of which there are far too few, many of them in the wrong place. Sentences run to thousands of words and scores of subordinate clauses, until the reader has no recollection of the main clause or indeed whether there ever was one." Agnès Poirier responds, suggesting that Greer must have been knocked on the head by Proust's works while dusting her bookshelves. "What exactly is the problem with Proust according to Greer? It's too long, apparently, therefore too expensive to acquire, and impossible to read in the bath. Here is literary criticism of the highest nature." She takes issues with Greer's picking on Proust's grammar ("artistic style," she says), and with translations. Poirier concludes "I won't start defending Proust and praise his prose. You only need to read him to know that it won't be wasted time. It could even change your life." Well. All I know is, having tried to get through about six pages of Proust and giving it up for temps perdu, I'm with Greer. But to each their own. If it makes you happy, read Proust. If it doesn't, don't. And if you're Greer and Poirier, keep up the exchange, it's entertaining for the rest of us. An Original Review of "The Wizard of Oz"
Book Review: "The Narrative of Arthur Gordon Pym"
Book Review: "The Case for Books"